The Giving Table has asked for help from Food Bloggers Nationwide to inform people of a growing epidemic. Hunger in The United States. If you read my blog regularly you know I am involved in many different ways to help with this issue. This is an affordable, healthy way to dinner, snack, or lunch. Just one way to look at it, the face of food stamps, SNAP, is changing and has been since the downfall of our economy in the past several years. Many hardworking, employed individuals, and families have had to rely on our government for help to feed their families. After all it is their fault we are in this situation anyhow. The stereotypes that people once had about those on food stamps no longer holds true for the most part. A working class family of five is having a harder time feeding their family partly because of lost hours at work, low wages compared to higher food costs, and general lack of work due to outsourcing. There are many factors that are facing the American population that the general public is not considering when thinking about the face of food stamps. Finding affordable, healthy ways to eat is important to help people on a tight food budget. Food deserts. Places in large cities like, New York, where families have no access to fresh fruits and vegetables for miles. Meaning many dollars are spent to get on a bus or train to go get food. How is that possible in The U.S.? No fresh fruit or vegetables to feed the children of this nation. It is so true. We have a voice, as with anything. If you don’t like something that is going on, say something I do. You can write a letter to congress, it takes five minutes at most. You can start a bake sale to help raise money, you can volunteer at a food bank. Educate yourself and other on the issues at hand. The statistics are out there, families on food stamps or SNAP spend a total of $4 on a meal for their family. $4, CAN YOU DO THAT? The way I eat, it is very difficult. I will be making a series of food over the next week of affordable dinners. This the side dish to what will be dinner on Monday April 8th. This is an adaptable recipe depending on what ingredients are in the house. The juice of the apple is sweet, so the honey is optional. And if there is no oil in the house, it is a good and healthy way to get fruits and veggies in for the day. 1 teaspoon lemon or any citrus, the remaining juice can be squeezed out, saved for other dishes or frozen for later use. 1. 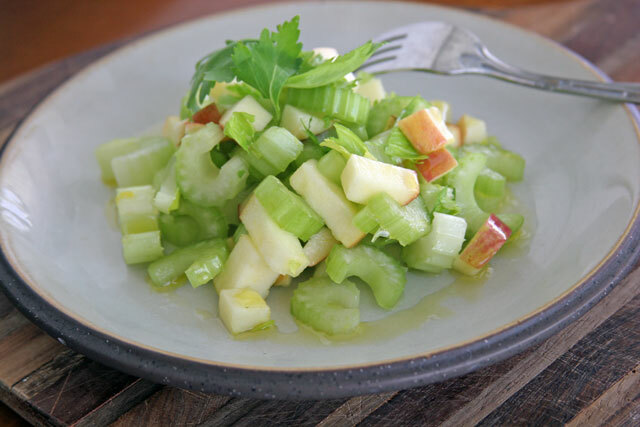 Combine the chopped celery and apples in a bowl with salt and pepper. Squeeze 2 teaspoons of citrus on celery and apple. Toss to combine. Drizzle 1 teaspoon of honey if using, and 2 teaspoons of oil over, toss to combine. Serve cold. I could easily eat a few plates of this crunch deliciousness!! Thank you! It was crunchy goodness. I hope you are well! What a beautiful, simple salad! Thank you so much. It really is simply delicious. Hey Fabi: I’m gonna make a slight alteration to your celery and apple salad by simply adding a little diced dill pickle (Clausens brand) to the apples and celery. Kind of a substitute for the salt. I’ve been craving these pickles lately. Cheers and thanks for the elegant and healthy recipe. Please give my regards to Brian. Conratulations on graduating from culinary college. Thank you commenting! Interesting sub for the salt, let me know how it goes. Brian says hi! We hope you are well.